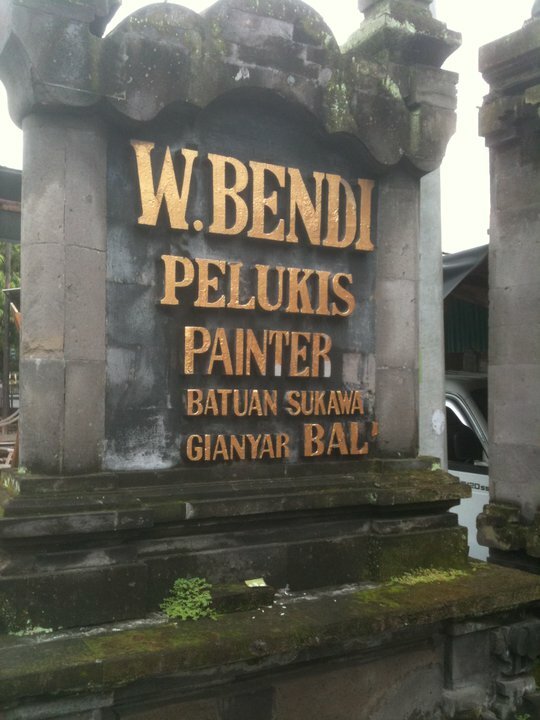 I Wayan Bendi’s studio, outside of Ubud in Bali. (Photo by author). In any case, I get the feeling that most Australian visitors don’t trouble themselves too much to think about Balinese culture: which meant that when my father and I stumbled upon the Neka Art Museum in Ubud, we had the place almost entirely to ourselves. It is a pretty unusual museum for those accustomed to western institutions: most of the rooms are quite open, allowing outside air to breeze through. Like much of Bali, the Museum has the feel of a sort of faded glory; a quiet resignation to the deleterious effects of modernity. I knew a little of Balinese art, but I wasn’t really looking for anything in particular. For my father and I, it was just nice to get away from the throng of street merchants selling tourist curios. 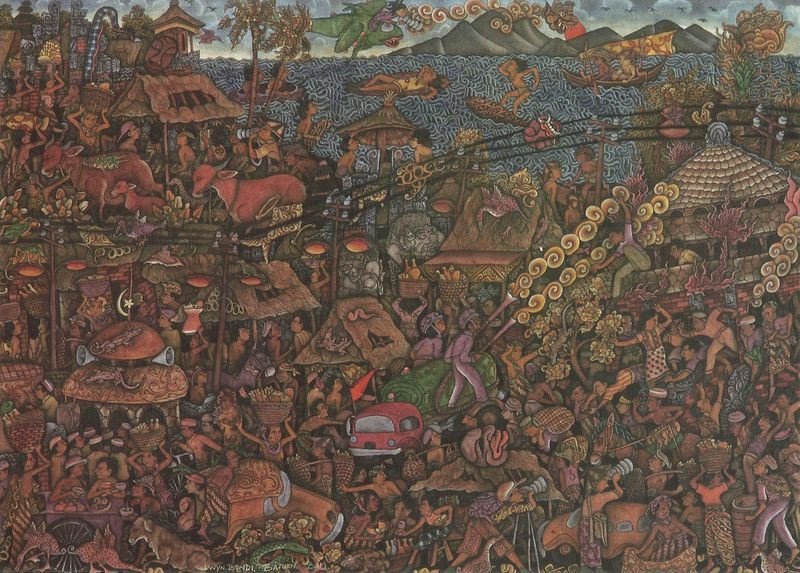 However, in the Neka Art Museum, I encountered an artist whose work immediately struck me: I Wayan Bendi. Over the next few days, I tried to seek out as much of his work as I could. Bendi was born in 1950 in Batuan, a village near Ubud. He is something of legend in Balinese art, considered one of the leading practitioners of the Batuan style of panting that emerged in the 1920s. In something that will certainly endear him to fans of Australian Indigenous art, Bendi attributes his own take on Batuan painting to a vision he had in a dream. Paintings in this style teem with action, and are crammed full of intricate details, pulsating with the chaotic rhythms of village life. A number of things struck me about Bendi’s work. The first, was the ease with which his narratives combined traditional/mythological elements with the mundane activities of daily life. Huge spirit figures team over scenes of people going about their routines. 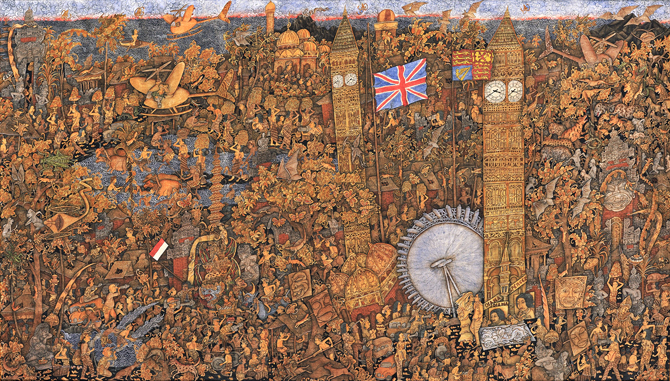 I was similarly struck with the adaptability of Bendi’s style to incorporate recent historical events: in Ubud I saw images that Bendi had painted of London and Singapore. 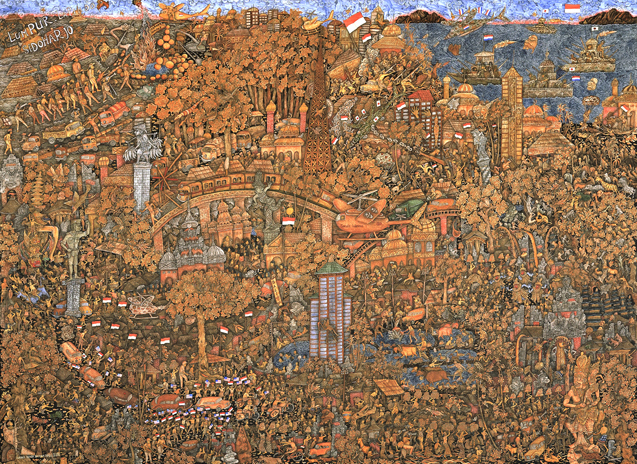 In other images, he depicts the Struggle for Independence against the Dutch (see above), the World Trade Center attack on September 11, the Bali Bombings of 2002, and even the death of Diana Princess of Wales (see below). Although his style of painting was deeply rooted in his homelands, Bendi was clearly comfortable using it to depict faraway places: from Jakarta to Singapore, Hawaii, London and New York. But the detail that struck me most in Bendi’s paintings was the recurring appearence in his Balinese paintings of the big-nosed western tourist, sporting a large camera. 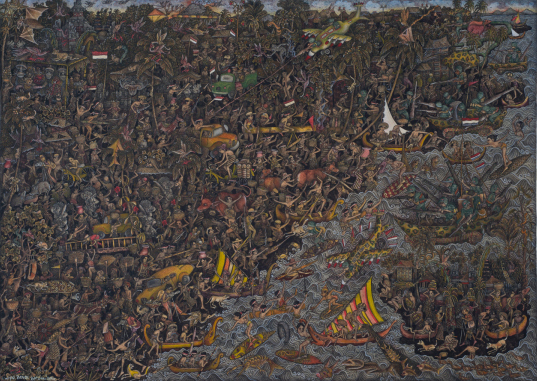 These figures were inevitably poking their noses/cameras into everyday events – often the cockfights made famous by Clifford Geertz (see for instance, in the lower right of the painting Kebakaran 1999 shown below). Amidst all of the action of this Batuan scene, Bendi seems to be critiquing the very act of looking. I loved this critical representation of the objectifying representational apparatus of the tourist/anthropologist. In a place like Ubud, where the packaging of Balinese culture for tourist display has created a tired simulacra of an exquisite tradition, Bendi’s paintings seemed magnificently subversive. I really hope I have the chance to see more of Bendi’s work – I think he is a first rate contemporary artist, and one whose work really warrants some serious critical inquiry.